Student Unions are busy places with a flurry of activity. There are numerous ways in which students and staff can be involved. Sometimes a little encouragement in the form of a fun prize can help increase involvement. The question is: how do you find the right item as a prize that will appeal to students? Marketing Director Erin Kober was looking for something unique and useful that would get students excited about the University of Minnesota’s Student Unions & Activities. Any promotional tech item is part of a popular and rapidly growing product category that suits the tech-savvy college student’s lifestyle. 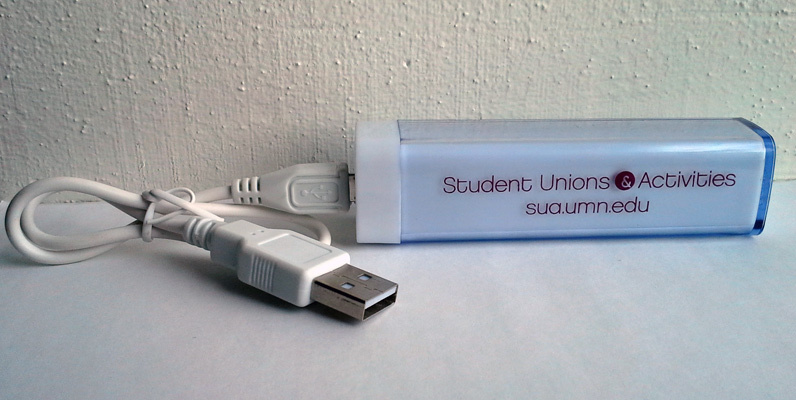 As one of our top new promotional items for colleges, the Charge-it-Up Power Bank charges devices on the go. As a higher valued item, it is perfect to distribute as a prize. Account Manager Elise Mannebach helped find a white Charge it Up Power Bank (item #DCZDE-JJIZH). She shared product details and sent Erin a sample, so she could test the product and obtain feedback from students before placing an order. After successful test-runs and student reviews, the team finalized artwork and Elise placed the order. The Charge it Up Power Bank can charge smartphones, MP3 players and more! It features a USB output and micro USB input and includes a cord. With the 2200 mAh lithium battery, your phone can be charged 1.5 times before having to re-charge the power bank using a wall charger (not included) or laptop. Available colors include black, green, red, white and blue. Additional power bank chargers are available with a larger battery, so they can charge multiple devices or one device multiple times. It all depends on the desired features, quantity, and budget. Students and staff alike are very excited to receive the Charge-it-Up Power Bank. They were given to students as prizes and given to staff for contributing to the Community Fund Drive. Since it is used time and time again, the chargers serve as a frequent reminder of the UMN Student Unions & Activities brand. The URL imprinted on the charger can also help increase website traffic.